It was great to see this news drop in my inbox this morning. Firstly because (in my opinion) the Cassini-Huygens mission is one of the most important planetary missions ever undertaken by humankind but also because it gives me the excuse to put up one of Cassini’s dazzling images on the blog. The Cassini-Huygens mission has given us views of another planet and its moons like no other spacecraft has and I’m routinely mesmerized by the views it sends back, let alone what its scientific instruments are telling us. It’s incredible to think that in the last six months Cassini has found evidence of: an ocean underneath Encealdus’s surface; a system of rings around Rhea and even organic material in the geysers on Enceladus. Above is my favourite recent image from Cassini. It shows Saturn when it was 2.6 million km from Cassini. 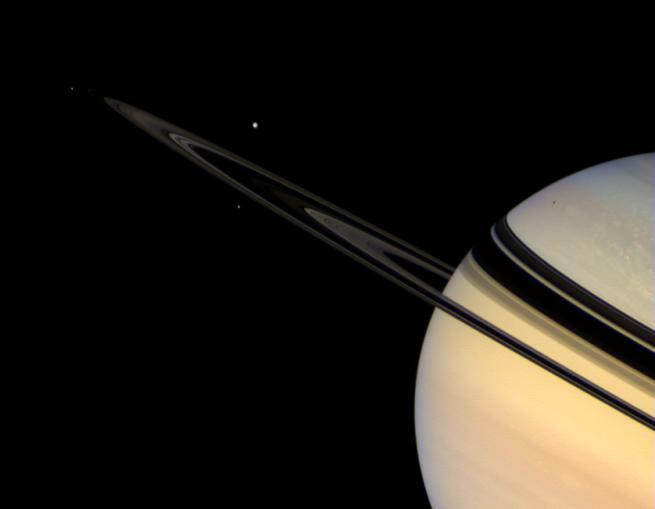 You can also see four of Saturn’s moons – Tethys, Mimas, Janus and Pandora. If you can’t spot them in the above image then have a scan around the stunning full resolution one available here.